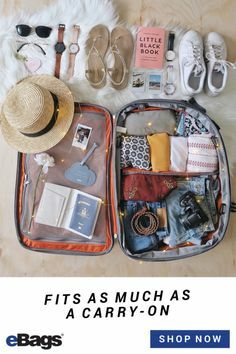 Home Tags Posts tagged with "Backpacking Europe"
Europe is bursting with diverse cultural experiences, making it the most popular destination for study abroad programs. If you’re waving goodbye to the USA and hello to the EU this fall, you’re about to embark upon one of the greatest journeys of your life! Studying abroad opens minds and diminishes borders while creating lifelong friends and memories. Europe’s architecture alone is awe-inspiring, from Gaudi’s whimsical masterpieces in Barcelona to Budapest’s Neo-Gothic Parliament building, towering over the banks of the blue Danube. And even some of the more crowded tourist attractions—Copenhagen’s Little Mermaid Statue and Munich’s Glockenspiel, for example—can be totally worth the trip if you’re with the right people. You’ll want small enough headphones to stash in your purse pocket, but powerful enough to block out the squeaky wheels of Eastern European trains. I prefer earbuds to bulky over-ear headphones, so I can listen to tunes while wandering around town or waiting for a bus—without overtly drawing attention to my gear. Music was a life-saver during my own European adventure, especially when it came time to fall asleep in a 12-bunk hostel room! I like Bose SoundTrue Ultra In-Ear Headphones because they allow you to lay on your side while listening to soothing sounds, drifting away after a long day of adventure. If you’re traveling on a student budget, it’s imperative that you make your Euros stretch as far as possible. An easy way to score massive savings is by choosing the cheapest form of transportation from Point A to Point B. While Europe is known for the EuroRail, the continent also boasts extensive bus and flight routes that are often cheaper than the train. Buses are usually the most affordable option, plus they offer scenic window views and free wi-fi! The only downside of bus trips is the length, but you can make that work for you, too. Bring a neck pillow so you can take advantage of the slow travel time by catching a few hours of sleep before exploring your next destination—especially if this is an overnight route! Opt for an inflatable version like the Eagle Creek Exhale Neck Pillow so it takes up virtually zero space in your bag. Overnight buses and trains are generally pleasant, and they’re also cost-effective since you’re saving on one night’s accommodation. And while they’re also generally pretty safe, if you’re planning on snoozing it’s best that you hide your money and valuables on your person. This Lewis N. Clark RFID Neck Stash is a travel-safety superhero, keeping your stuff stowed where thieves can’t touch it without waking you. It’s easily attached to your body and concealed from sight, and the built-in RFID technology goes above and beyond to prevent cyber sneaks from wirelessly stealing your sensitive information. Of course, we can’t forget about the tried-and-true method of stopping thieves: locks. Locks rock! While in transit, you can use them on your luggage. When at a hostel, you can use them to lock your luggage locker. Just make sure they’re TSA-friendly to prevent any delays at airport security. The Lewis N. Clark TSA Sentry Cable Locks are TSA friendly and their cable lock system ensures they’ll fit around any type of locker. A scenario that happened to me far too many times in Europe involved me running—like, Olympic-level sprinting—to catch a departing train. Perhaps you’re more responsible than I am, but if you’re a procrastinator, then Europe’s legendary promptness might present a challenge. 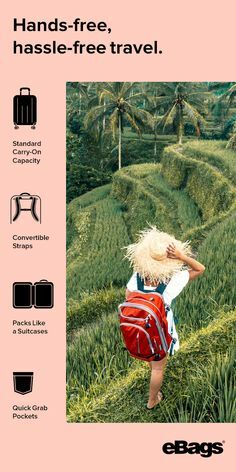 I was usually lucky enough catch my train because I traveled with a backpack, so could avoid dragging a bulky bag over the continent’s ubiquitous cobblestones. 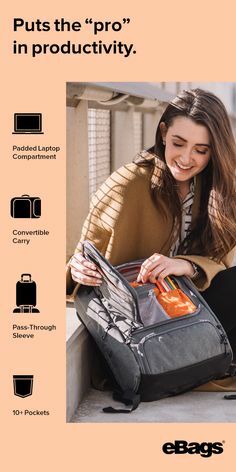 The eBags TLS Mother Lode Weekender was designed specifically for this kind of getaway, with small-item organizer pockets, interior shelves, and dividers that can help calm the chaos of one-bag living. 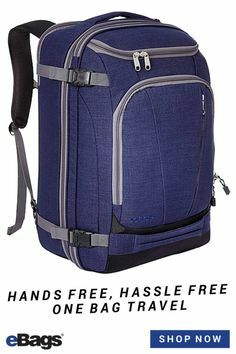 The slightly smaller version of this bag, the TLS Mother Lode Weekender Junior, is perfect for budget European airlines that have harsh carry-on regulations (and even harsher baggage fees). Not exactly real problems, but it can be challenging to go without a proper closet for months at a time. The first time I backpacked around Europe, my bag was pure chaos, with no distinction between my clothes, shoes, toiletries and the ever-growing jumble of souvenirs. Thankfully, my rookie mistake was corrected by eBags Ultralight Packing Cubes. 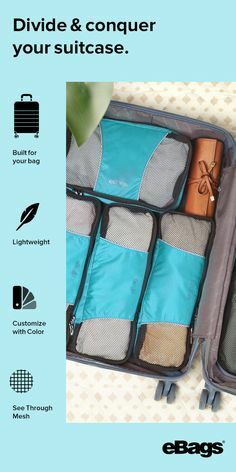 Organizational cubes literally restored my sanity during my study abroad experience, as I was able to separate and quickly access my belongings. If I was packing in a hurry, I could simply toss all the cubes in my backpack without ruining the organizational efforts. 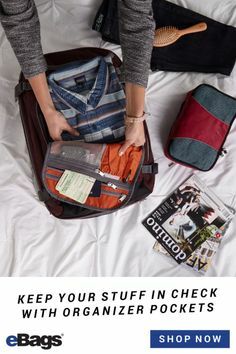 When I arrived at a destination, I could spread out my bags without seeming sloppy. 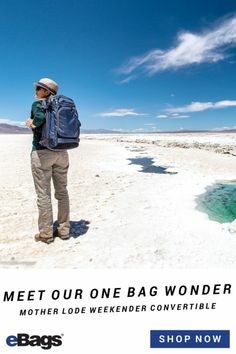 I used eBags Packing Cubes for every category: tops, bottoms, dresses, jackets, dirty clothes, hats, intimates, first aid supplies, electronics, toiletries, snacks…and they made living out of my backpack a breeze. Let’s say you’re NOT a procrastinator. Perhaps you imagine yourself arriving 30 minutes early at the station, looking chic and European with a cappuccino in hand. If this is the case, it might make sense to invest in a hard-sided roller bag. When I was backpacking Europe with my 30-pound backpack and stuck standing on a crowded platform or train, I have to say that those lucky travelers with killer hard-sided rollers *might* have gotten a bit of side-eye from me. The Helsey Helium Titanium International Carry-On Spinner Trolley is a super ideal solution. The spinner wheels allow you to smoothly wheel it on and off trains and metros! My favorite afternoons were spent the European way: picnicking in a park. European cities are full of world-class parks with tons of people enjoying them. All you need is wine, cheese and speakers for a miniature private party in the center of town. 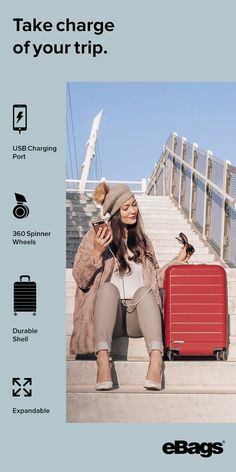 Add to the ambiance by playing the local Spotify Station on some portable wireless speakers, and protect yourself from local weather by investing in a waterproof speaker like the Ultimate Ears Roll 2 Speaker—this is especially important as you travel north to British and Scandinavian destinations.